People living or working in high-rise buildings are often exposed to danger many metres above the ground. This includes the risk of being trapped by flames in the event of a fire. The importance of inhabitants and workers being able to rescue themselves in an emergency should therefore not be underestimated. 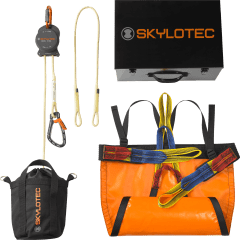 As a manufacturer of fall protection equipment, SKYLOTEC now offers the “Deus Exit Kit” to allow people to leave a building safely and independently if other escape routes are already blocked. A number of new high-rise buildings are currently under construction in Germany, where very few building sites are left, particularly in big cities and urban areas. This presents a huge challenge when it comes to the safety of those who will live or work in these kinds of buildings. Right from the planning stage, sufficient escape routes via emergency stairwells or turntable ladders from the exterior of the building must be taken into consideration. Unfortunately, scenarios do still exist in which these escape routes cannot be used. In emergency situations such as a fire, escape routes for inhabitants or workers may no longer be accessible as they may become blocked. This can lead to fatalities on floors above the source of the fire, particularly when these floors are too high to be reached by turntable ladders on emergency vehicles. For some people, it is therefore important to be able to prepare for such scenarios – for example by acquiring their own “personal additional escape route”. As the leading manufacturer of fall protection equipment, SKYLOTEC now offers a suitable solution for vacating a building safely via a window. Using the “Deus Exit Kit”, an individual can quickly and independently abseil down the outside of a tall building towards the ground. The “Deus Exit Kit” includes the “Deus 3700” abseiling device, which has been used for years in industrial applications and by fire departments worldwide. The EN 341 certified device is small, light and fitted with centrifugal brakes. This allows safe, hands-free abseiling at a constant speed. The abseiling device also has a flame-retardant rope and can therefore be used even in extreme situations. The “Deus Exit Kit” is available in three different rope lengths ranging from 10 to 50 metres and can therefore be used for a descent of between 3 and 16 storeys. However, simply supplying this kind of evacuation system alone is not enough. After all, before an emergency arises, users must also select a suitable anchor point. This should be able to withstand a load of at least 1.2 tonnes. An anchor sling or rope, also included in the set, can then be attached to a steel beam, for example. SKYLOTEC also offers other options, which can be individually adjusted to suit the situation in which the equipment will be used. These include an attachment clamp for steel beams and a door truss with eyelets for users to attach to their systems. These can be used to stick or screw anchor points to existing building structures such as walls or steel beams. If users want to be able to abseil safely in an emergency, it is vital that they concern themselves in advance with how to use the equipment correctly. Learning how put the “Deus Exit Kit” on safely and how to select various anchor options are factors that that should not be ignored. SKYLOTEC, which offers a wide range of training programmes as well as a comprehensive selection of products, can be a reliable partner here. The family company from Neuwied offers training modules for private individuals and employees, which are specifically tailored for rescue from high buildings using the “Deus Exit Kit”.